Prague's geographical location in Central Europe allows for some fairly extreme weather patterns. 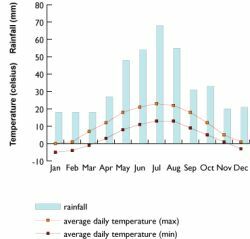 There are marked differences between the seasons, with spring being warm and fairly dry, the summer hot and sunny and also quite wet, autumn cool and wet and winter very cold with ice. Snow is rare in Prague during winter. The average temperature in December and January is a very cold -5°C (23°F). In the hottest months, June and July, the temperature usually hovers at around 30°C (86°F). At night, temperature falls to 15°C (46°F). The wonderful climate contrasts simply add to the romantic nature of this beautiful city, which is well equipped to keep visitors comfortable all year round.